"I like money on the wall. Say you were going to buy a … painting. I think you should take that money, tie it up, and hang it on the wall. Then when someone visited you, the first thing they would see is the money on the wall. " Van de Weghe Fine Art is pleased to present an exhibition of Andy Warhol’s Dollar Sign paintings. Executed in 1981, the series was first shown at Leo Castelli Gallery in January of 1982. The paintings have since come to be recognized among the artist’s most important signature works, epitomizing Warhol’s fascination with commodity culture and its icons. Money first caught Warhol’s attention in the early ‘60s, when he began drawing images of one and two dollar bills that he would eventually silk-screen on canvas, both singly and serially. 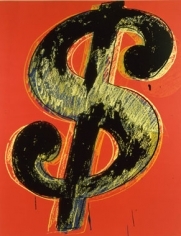 Returning to the subject in 1981, Warhol isolated the symbol denoting “dollars” – the “Dollar Sign” – and made this the focus of the artwork, silk-screening multiple “$” in vivid colors one over another. By the ‘80s, Warhol’s paintings had become icons of popular culture themselves. Warhol had achieved an unparalleled level of success that allowed him to declare: “big-time art is big-time money”. With their Warholian brand of irony, the Dollar Signs are not only a reflection on American culture and of Warhol’s love of it, but on his own accomplishment. This exhibition – the first in New York since Castelli’s show in 1982 – will focus on the largest canvases of the series: 90 x 70 inches (2,25 m X 1,75 m). A number of original works on paper, illustrating the many variations Warhol considered for his quintessential symbol for money, will also be on view. The gallery publishes a fully illustrated catalogue to accompany the exhibition, featuring an essay by curator and critic Trevor Fairbrother.